In any creative relationship, the conflict pretty much walks through the door right away. Everyone has their own idea, their own picture in their head of the way they see a particular creative endeavor. You get two people together with different ideas then there will be conflict. The key is to work through the conflict and compromise. That's what Harold and I do. 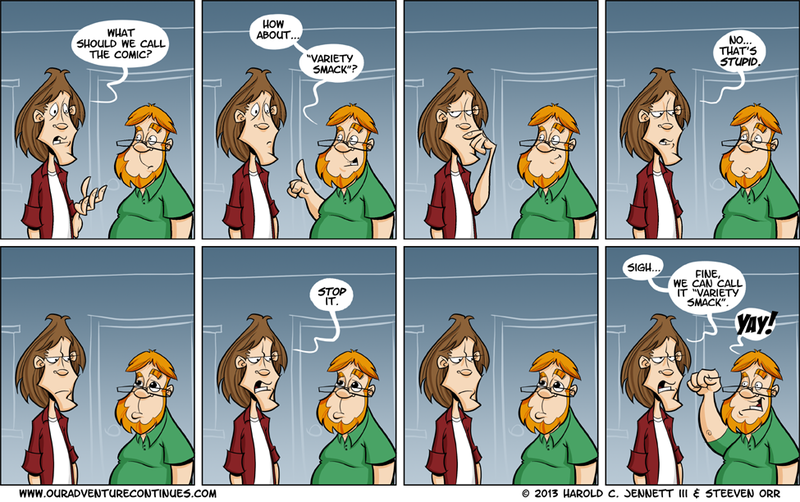 We went round and round about the name 'Variety Smack' when we first started this web comic venture. On Monday Harold would like the name and I'd hate it. On Tuesday I'd like the name and Harold would hate it. On Wednesday we would both hate it and then we'd decide to just pack it all in. On Thursday we would both confess that we really like the name and are ready to move forward only to find that one of us changed our mind on Friday. Yet, despite all of that, here we are.